Most allopathic medical scientists and medical practitioners scoff at the idea of detoxification protocols, except when an individual has actually been poisoned. This is understandable. Why? Because the body is designed with the ability to cleanse itself quite efficiently. However, the problem that is often left “unspoken” in the standard medical community is when the detox pathways of the body are chronically inhibited. To compound this issue, individuals with various lifestyles and genetic makeup are more or less susceptible to the increasingly toxic environment that contributes to this failure; there is no one “test” to quantify this, as these issues are highly individualized. Standard medical science is currently ill-equipped to handle the growing issue of chronic toxic exposure to the post-industrial world and its chemicalized food sources. Furthermore, most practitioners are not properly educated as to exactly how the body achieves cleansing, nor how this process can fail. Furthermore, our world and environment is changing at such a rapid pace that the “old” solutions for natural cleansing and recovery from chronic illness are proving to be too little too late for many. Most importantly, the old methods may not be up to the task of dealing with the levels and types of toxicity that the corporations of the industrial age have so mercilessly thrust upon us all. While I borrow extensively from traditional natural medicine practices, it has become crystal clear to me that practitioners of these systems of medicine have not updated their methods to match the problems of the present times, nor have they modified the modalities to encompass the increased knowledge and experience of the last few hundred years. Furthermore, much of the actual wisdom behind many of the traditional formulas and methodologies has been lost, leaving even the most dedicated practitioners incapable of applying creativity and innovation when problem solving complex chronic health issues. In the case of all too often failure with traditional systems of medicine (not to mention modern medicine), this leaves an individual dazed, confused, and unable to figure out what to do next. Without the wisdom accompanying the formulae, and without the body to mind intelligence and awareness, even some of the best traditional medicine practices leave an individual at the gates of despair. It is my opinion that we need new tools and strategies in natural and ‘alternative’ medicine, as well as a concise road map based on modernized and simple core principles to guide the way. Digestion is a more complex form of a more “elemental” and primal, single celled biological activity: Cellular respiration. Nutrients are taken into the cell, processed via a chain of chemical reactions, and waste is expelled. While this process produces energy, it also takes energy. Homeostasis is required for this very simple process to occur, and homeostasis is directly dependent upon the environment around the cell. The body’s respiratory system (air/oxygen intake), and the body’s digestive system are solely responsible for both providing the nutrients needed for energy conversion, tissue building, cell reproduction, cleansing (waste elimination) and maintaining the extra-cellular environment. When digestion begins to fail, normal, natural detoxification becomes problematic, and is hence also destined to fail. This is why any successful and comprehensive detoxification program MUST start with digestion, and why so many detox protocols and programs fail to achieve the desired results, and in some cases, cause even more problems. Digestive system failure results in detoxification failure, severe microbial imbalance in the gut (and eventually systemically) , immune system failure (along with a host of terrible immune system syndromes), and energy conversion problems. Therefore, it is absolutely critical that an individual be able to fully and properly digest everything an individual consumes, and this must be a priority for the recovery from any chronic illness, and a central key to proper elimination and detoxification in the body. While many modern day “detox experts” ignore the primary principle of digestion in favor of IV solutions and detox chemicals, this fact is very well known among studious naturopaths across the globe. This is why some of the most effective detoxification programs require some form of fasting. If the digestive system cannot be directly mastered (which takes much work and knowledge…and cooperation by the participant), then a simple and elegant solution to help the body cleanse: Shut the digestive system down while cleansing. Since digestion requires more energy in the body than all other normal metabolic processes except cardiovascular function, shutting down the digestive system frees up an immense amount of physical resources which the body quickly begins to utilize to clean house. Fasting has been used for centuries to cleanse the body and help reboot the digestive system. Many amazing natural and herbal doctors (including Dr. Richard Schulze) would tell their very ill patients: “You are too sick to be eating food.” People have been conditioned since birth to think that three square meals is both ideal and necessary for good health. Over-eating is a big contributing problem to digestive system damage and reduced function. When working to restore digestive system function as a part of detoxification, under-eating is a good idea; at some stages, an individual may very well only desire a meal once or twice daily. Numerous excellent recovery diets have been created in order to assist digestion. GAPS is among the best, as are many of the “cave man” dietary philosophies. Some of these types of programs rely upon the ideology that right eating will result in good health, and do not appear to be directly targeting healing the digestive system. I’m certainly NOT here to tell individuals what they should or shouldn’t eat; there are too many individual factors to be considered, including ancestral eating habits, social considerations, genetic factors (more and more are being discovered as time progresses), and even the types of foods eaten by one’s mother during pregnancy. To follow the principle of digestion for successful detoxification, one need ONLY be certain that one is successfully digesting all substances consumed. Some people may need very specific eating plans to achieve this. Others may need to reduce the amount of food consumed. Others may need to reduce the frequency in which they eat. Obviously, healthy eating is important, but the term “healthy” will mean different things to different bodies. Considering that many spiritual cultures consider the stomach as the seat of judgement, individuals will no doubt need to learn to practice good judgement with eating habits, as well as how to tap into the innate inner intelligence of the body. This is a process of discovery, and it can be a very enjoyable process; it doesn’t have to be self torture! The final point I’d like to make concerning eating for health and survival: It’s not complicated! Complex and tyrannical eating habits are not actually pro-survival ideas, but very counter-survival. If you look at the history of human kind, we would have all died off long ago if we had to follow a thousand rules three to five times daily. The issue at hand is the problem patterns that we’ve created in our lives and environments, both as individuals and collectively as a civilization. The complex part is weeding these out, correcting them, repairing the damage done, and compensating for a world that becomes more unnatural with each passing day. Just like digestion starts with saliva, circulation starts with breathing. In fact, poor breathing habits can directly impair digestion. Poor breathing habits and chronic compression patterns can inhibit nerve signals from the Vagus nerve; poor breathing and a compressed chest/abdomen go hand in hand. These chronic stress patterns– which all start with every breath taken and finish with every breath expelled– greatly inhibit the entire central circulatory system. The hardest thing to communicate to individuals working with detoxification and recovery programs is the importance of deep breathing; specifically, decompression breathing which involves retraining to breath both abdominally and full chest expansion breathing. The breath is responsible for far more than simply delivering oxygen to the bloodstream through the lungs and the expulsion of CO2. It has a profound effect on the central nervous system, and ultimately: Efficient use of physical energy. The cardiovascular system is the engine of the body’s circulatory system. Primary circulation MUST be perpetually addressed for proper detoxification. Far too often an individual fills the stomach with expensive herbs and supplements without giving a thought that these substances must not only be digested, but delivered to where they are needed. Those with sluggish digestion almost certainly have impaired circulation. Addressing the central circulatory system is two-fold: Dealing with “nutrient” delivery through the bloodstream and dealing with toxins and waste being carried out by the bloodstream. What do I mean when I stated “perpetually” addressing the circulatory system? In many situations, circulation must be stimulated all throughout the day in order to get the body’s natural elimination processes working properly. There are many ways to do this, and all of them should be used, including herbs, physical exercise, breathing exercises, and hot and cold therapy. Circulation is ultimately three-fold. We have circulation of pranna (breath), cardiovascular circulation, and lastly, lymphatic circulation. Lymphatic circulation is often the hardest to deal with, and lymph congestion and blockages are responsible for many serious illnesses. While there are special devices for lymph drainage (electromedicine devices), and special lymph massages, the easiest ways to stimulate lymph drainage is vigorous exercise and hot baths (in our case, specifically clay baths with sea minerals). 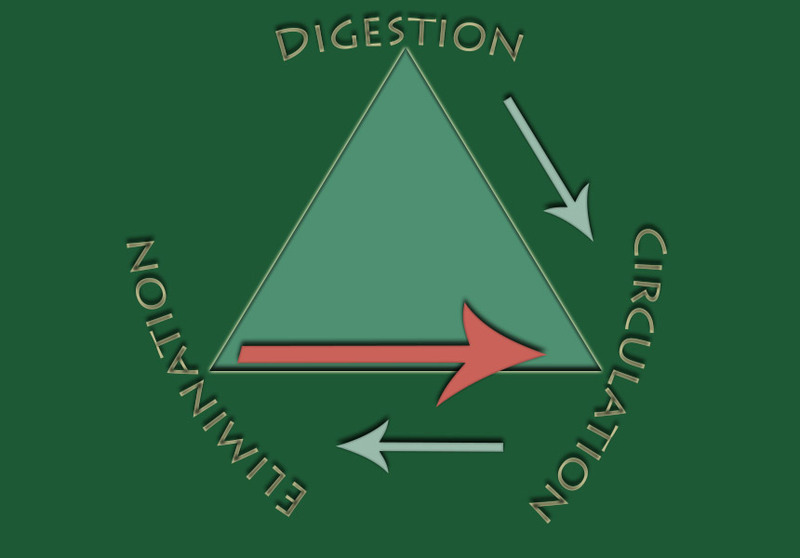 While circulation is the 2nd principle of detoxification, it is the pivotal principle, and the one most often neglected. The complication occurs when energy conversion is already compromised in the body due to toxic overload primarily caused by… digestive system impairment. The build-up of toxic waste in the body due to metabolic dysfunction is the greatest barrier to successful cleansing. By toxic waste, I mean normal metabolic waste, as well as bio-toxins (usually from infectious organisms), and chemicals/metals that have no business being in the body in the first place. Elimination is four-fold: 1. Waste elimination through feces via the colon. 2. Waste elimination through urine via the bladder. 3. Waste elimination though sweat/oils via the skin. 4. Waste elimination from the lungs via the “breath”. The biggest problem with the elimination system occurs in the colon (or, generally speaking, Phase III detoxification), where substances that the body is trying to eliminate are re-absorbed back into the bloodstream, which eventually greatly effects liver function and then kidney function. Disorders like this have many names including Leaky Gut Syndrome and Crohn’s Disease. However my advice to the sufferers: Acknowledge the symptoms, then cast off the chains of your diagnosis. Here, we naturally wrap back around to the first principle, as if the process were circular: Correcting the function of the colon is first and foremost dependent upon fully digesting the substances one consumes, which does many things, but perhaps most importantly, it reduces the “over-active” immune system’s choice response: Inflammation. Traditional edible clay is of course the single choice substance to assist healing and cleansing the digestive system; it also acts as a catalyst for systemic detoxification. However, when the body has been in a chronic state of severe dysfunction, the body often needs much more help. There are quite a few great substances out there that help colon function. The idea is to properly stimulate (or calm) colon function, while being absolutely certain to bind toxic substances, preventing them from re-adsorption. Fibers, herbs, clay, activated charcoal, and diatomaceous earth all have their proper place in digestive system cleansing. With colon function addressed, a program may then be devised to start to knock down and eliminate pathogenic microorganisms as well as start to naturally encourage the body to start dumping all of the toxic waste stored in tissue. All of these final strategies must be completely tailored to the individual, based on individual tolerance and state of health. This is an ideal road map to work with when dealing with detoxification. Any successful cleansing program must address all three of these principles equally, and mastered programs usually address them all at the same time, either all together at once, or through phases. For a comprehensive dietary and basic detox program, check our independent nutritional and detoxification study program. For a very simple “bare bones” digestive system/colon cleansing protocol, see Earthcures.org’s new program: Basic Bare Bones Digestive System Cleanse. Explore the three core principles of detoxification; a new perspective on detoxification.